We went to the funerals of too many California farm workers who needlessly died from extreme heat—and aided their families. I will always remember being at the service and consoling the family of Maria Isavel Vasquez Jimenez. She was only 17 and pregnant when she collapsed into her fiancé’s arms at a vineyard near Stockton—and the farm labor contractor delayed getting her medical treatment for more than an hour and a half. Her death was totally avoidable. Another farm worker heat death we endured was Audon Felix Garcia. His brother, Raudel Felix Garcia, just completed his testimony. Thank you, Raudel. After a spate of heat fatalities of California farm workers, in 2005 the United Farm Workers helped convince then-Republican Governor Arnold Schwarzenegger to issue the first comprehensive standards in the nation to prevent heat death and illness by farm and other outdoor workers. We worked with Democratic Governor Jerry Brown to strengthen the regulations and their enforcement in 2015. Some heat deaths still persist even in California, although our state heat rules have saved thousands of farm and outdoor workers from being stricken. They have saved countless lives. We use our UFW contracts to enforce government protections at unionized farms. Farm workers benefiting most from the state heat standards labor on non-union farms. Deaths and injuries from extreme heat are still too common in states without any protective standards. UFW Foundation organizers recently went to Georgia to investigate the troubling fatality of an H-2A farm worker. Farm workers are not agricultural implements. They are important human beings who sweat and sacrifice to feed millions of people across America and the world. They shouldn’t risk death or illness just by going to work when temperatures soar. Thirteen years ago we got a Republican governor to take action. Three years ago we worked with a Democratic governor to beef up the heat standards. Republicans and Democrats can take action today to stop these unnecessary deaths by creating national standards such as those we won in California. 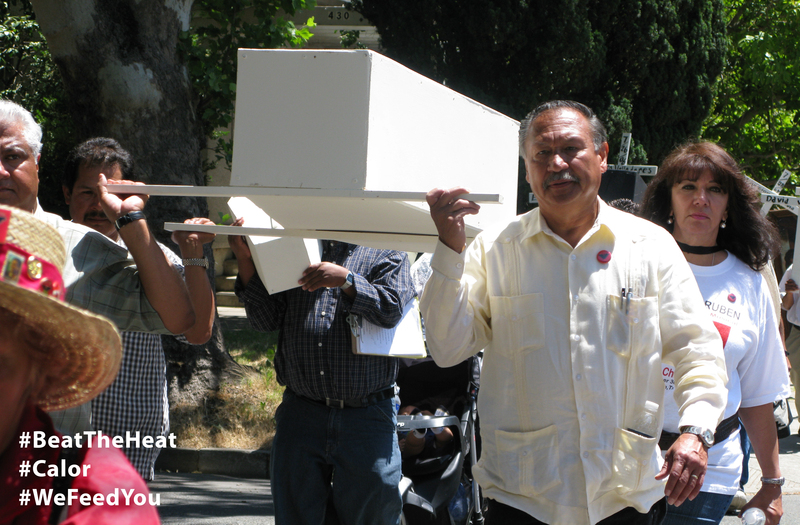 Photo caption: United Farm Workers President Arturo S. Rodriguez (right) carrying a symbolic casket honoring farm workers who perished from extreme heat in California. A spate of heat deaths helped the UFW convince then-Republican Gov. Arnold Schwarzenegger to issue the first comprehensive state rules in the nation to prevent farm and other outdoor workers from dying or becoming ill from the heat. Now the UFW and UFW Foundation are joining a national campaign to protect outdoor workers across the country under federal standards.